Should Doctors Ask Older People If They Have Guns At Home? : Shots - Health News Pediatricians have long asked parents if they have guns in the home, in an effort to reduce accidents and suicides in children and teens. That could help protect older patients too, a study says. But the notion of doctors asking about gun ownership is controversial. Older men may have guns in the home that can pose a risk when people are depressed or not thinking clearly. "There's been so much attention to the role of physicians and the safety of young children when there are guns in the home," says Marshall Kapp, a professor and director of the Center for Innovative Collaboration in Medicine and Law at Florida State University, and author of the paper. "We really haven't seen much discussion in the physicians' role regarding older patients." For decades, pediatricians have asked parents about guns in the home and safe storage methods, in an effort to reduce accidental deaths and suicides among children and teenagers. But there are no similar physician policies for adults. With older adults, "we don't think about prevention and safety the way we would with children," Kapp told Shots. "An older person who is seriously compromised by mental disorders is in many respects as helpless and vulnerable and dependent as a child would be." Men are far more likely to commit suicide than are women, and are more likely to use firearms. Higher rates of gun ownership correlate with higher suicide rates. That's one reason why public health officials look at firearms access as a possible means of preventing suicides. Kapp's paper, which was published in Annals of Internal Medicine, focuses on reducing the suicide risk in older adults. But doctors might need to start asking if middle-aged men have a gun cabinet, too. Suicide rates among middle-aged men have risen over the past decade, from 21.5 to 27.3 per 100,000 from 1999 to 2010. That rivals the rate among white men over 65, of 30 per 100,000. White men over 85 have the highest suicide rate of any group, at 47 per 100,000. Researchers say it's unclear why older men are more apt to kill themselves. It could be risk factors such as social isolation and lack of coping skills, or easier access to lethal means. Kapp thinks it will soon become "prudent practice" for physicians to ask about guns in older patients' homes, but no medical organizations have proposed such a policy. It would also mean that family members may have to act, which can be difficult, as anyone who has dealt with an older parent and the issue of driving can attest. And talking about guns with patients and their families can be politically dicey. Last year Florida passed a law, dubbed the "Docs vs. Glocks" law, restricting doctor-patient discussions about guns. 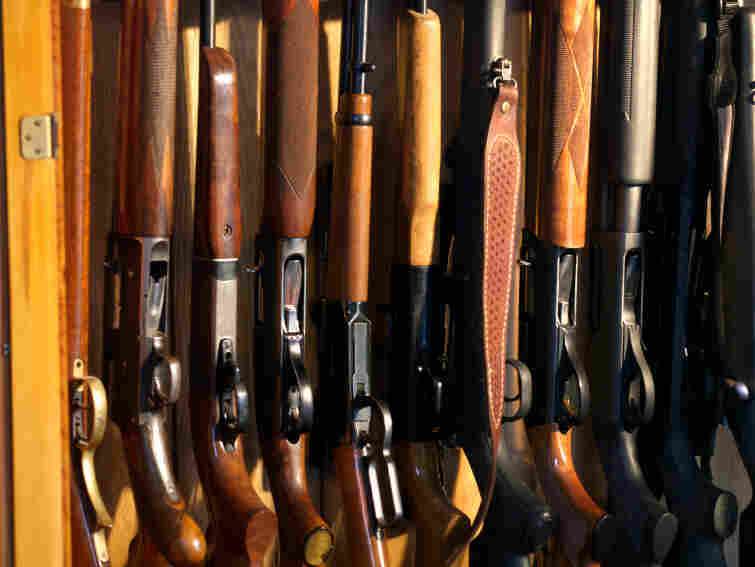 But an appeals court upheld the doctors' right to discuss gun safety. Other states have considered similar laws, but haven't enacted them.